You are here: Home › Further Reading › JFK Assassination FAQs › Was Oswald an Expert Marksman? Lee Oswald qualified as a sharpshooter in the Marines in 1956, but his skill deteriorated and by the time he left the Marines, more than four years before the assassination, he was officially 'a rather poor shot'. Even after fixing some of the gun’s mechanical problems, and despite firing at stationary targets from an easier vantage point, they failed to achieve the combination of accuracy and speed demanded of the lone gunman: two hits out of three, within about six seconds (see Warren Commission Hearings , vol.3, p.446 and pp.403–10). In December 1956, after “a very intensive 3 weeks’ training period” ( Warren Commission Hearings , vol.11, p.302), Oswald scored 212: two marks above the minimum for a ‘sharpshooter’. The Marine Corps consider that any reasonable application of the instructions given to Marines should permit them to become qualified at least as a marksman. To become qualified as a sharpshooter, the Marine Corps is of the opinion that most Marines with a reasonable amount of adaptability to weapons firing can become so qualified. Consequently, a low marksman qualification indicates a rather poor “shot” and a sharpshooter qualification indicates a fairly good “shot”. Folsom agreed with his (not her) questioner that Oswald “was not a particularly outstanding shot” ( Warren Commission Hearings , vol.8, p.311). During his tests, Oswald had used “presumably a good to excellent rifle” ( Warren Commission Hearings , vol.11, p.304). The Mannlicher Carcano rifle that was discovered on the sixth floor of the Texas School Book Depository, however, was a “cheap old weapon” ( Warren Commission Hearings , vol.4, p.29). Every time we changed the adjusting screws to move the crosshairs in the telescopic sight in one direction it also affected the movement of the impact or the point of impact in the other direction. … We fired several shots and found that the shots were not all landing in the same place, but were gradually moving away from the point of impact. There were several comments made — particularly with respect to the amount of effort required to open the bolt. … There was also comment made about the trigger pull … in the first stage the trigger is relatively free, and it suddenly required a greater pull to actually fire the weapon. … The pressure to open the bolt was so great that that we tended to move the rifle off the target. Sergeant James Zahm, an expert shooter, considered that a rifle with a telescopic sight, such as the Mannlicher Carcano, needed to be “sighted–in” by firing the rifle about ten times without ammunition shortly before firing it with live ammunition ( Warren Commission Hearings , vol.11, p.308). Ronald Simmons also pointed out the necessity of recent practice “with this weapon [the rifle discovered on the sixth floor], I think also considerable experience with this weapon, because of the amount of effort required to work the bolt” ( Warren Commission Hearings , vol.3, p.449). When Did Oswald Last Use a Rifle? Lee Oswald and his brother Robert went on several hunting trips before Lee’s defection to the Soviet Union in 1959 ( Warren Commission Hearings , vol.1, pp.325ff). In Russia, Oswald joined a hunting club, and used a shotgun, but not a rifle. There were “a half dozen” shooting expeditions, which appear to have been largely social occasions ( Warren Commission Hearings , vol.2, p.466) and an excuse for Oswald to get into the countryside (Commission Document 344, p.21). MARINA said she had never seen OSWALD practice with his rifle or any other firearm and he had never told her that he was going to practice. She cannot recall that he [Oswald] ever practised firing the rifle either in New Orleans or in Dallas. She does not think he did practice in New Orleans because as a rule he stayed home when he was not working. When he did go out, she did not see him take the rifle. The reporting agent interviewed Marina Oswald as to whether she knew of any place or of a rifle range where her husband could do some practicing with a rifle, and whether she ever saw her husband taking the rifle out of the house. She said that she never saw Lee going out or coming in to the house with a rifle and that he never mentioned to her doing any practice with a rifle. Marina Oswald was asked if she ever saw her husband doing any dry practice with the rifle either in their apartments or any place else, and she replied in the negative. Did you ever see him clean the rifle? Yes. I said before I had never seen it before. But I think you understand. I want to help you, and that is why there is no reason for concealing anything. I will not be charged with anything. Did you learn at any time that he had been practicing with the rifle? I think he went once or twice. I didn’t actually see him take the rifle, but I knew he was practicing. Could you give us a little help on how you knew? She said [that] on an evening in March, 1963, … OSWALD left the house at about 6:00PM. OSWALD had his rifle wrapped up in a raincoat … When OSWALD returned about 9:00PM, he told her he had practiced with the rifle. Unfortunately, the rifle which Marina Oswald had apparently watched her husband clean early in January 1963 did not come into his possession until more than two months later, toward the end of March ( Warren Report , p.119). She advised she had been mistaken on February 17, 1964, when she said she had recalled OSWALD cleaning his rifle at Neely Street, at which time he made the statement that he had been practicing. … On the other occasions of his cleaning the rifle … he did not say he had been practicing. MARINA deduced that he might have been practicing with the rifle. The Warren Commission was aware that many of Marina Oswald’s statements were contradictory and unreliable, and that she was under pressure to tell the authorities what they wanted to hear. According to an internal Warren Commission document, which became public 15 years after it was written, “Marina Oswald has repeatedly lied to the [Secret] Service, the FBI, and this Commission on matters which are of vital concern to the people of this country and the world” ( HSCA Report , appendix vol.11, p.126). Marina Oswald testified that in New Orleans in May of 1963, she observed Oswald sitting with the rifle on their screened porch at night, sighting with the telescopic lens and operating the bolt. In an internal Warren Commission memo, Wesley Liebeler criticised an early draft of the Warren Report , pointing out that “we should be more precise in this area [Oswald’s rifle practice], because the Commission is going to have its work in this area examined very closely”. He tacitly admitted the weakness of the evidence by begging the question: “the best evidence that Oswald could fire his rifle as fast as he did and hit the target is the fact that he did so”. There is no pat answer to the question of how fast Oswald’s rifle could be fired. In the first place, we did not test his own rifle. It seemed reasonable to say that an expert could fire that rifle in five seconds. It seems equally reasonable to say that Oswald under normal circumstances would take longer. But the circumstances were not normal. He was shooting at a president. So our answer is: probably fast enough. In other words: although all the evidence indicates that Oswald could not have done what expert marksmen were unable to do, we will ignore this and conclude that he did it anyway. Summary: Was Oswald a Good Enough Shot? The Mannlicher Carcano rifle found on the sixth floor of the TSBD was in an unsatisfactory condition, with an inaccurate telescopic sight and an unpredictable trigger mechanism. To fire the rifle accurately, it was necessary to practise intensively. There is no credible evidence that Lee Harvey Oswald had fired a rifle of any sort for several years before the JFK assassination. Even after correcting some of the sixth–floor rifle’s mechanical problems, and in conditions substantially easier than those that would have been faced by a hypothetical lone gunman, expert riflemen from the army and the FBI were unable to fire the rifle as accurately as Oswald was supposed to have done during the assassination (see Oswald’s Rifle and Paraffin Tests). Even at his best, Oswald had never been as good a shot as the experts from the army and the FBI. Oswald’s most recent test score in the Marines was barely above the minimum qualifying level. He was officially “a rather poor shot” ( Warren Commission Hearings , vol.19, p.18) in 1959, and was hardly likely to have improved over the next four years. Was Oswald the Lone Gunman? Lee Harvey Oswald was almost certainly not a good enough marksman to fire three shots within six seconds at a moving target, scoring two hits out of three, with a rifle that was inaccurate and unreliable. If President Kennedy was killed by a lone gunman, that gunman can only have been Oswald. The inadequacy of Oswald’s marksmanship, when combined with other evidence, in particular the severe implausibility of the single–bullet theory, demonstrates that the assassination was the work of more than one gunman. 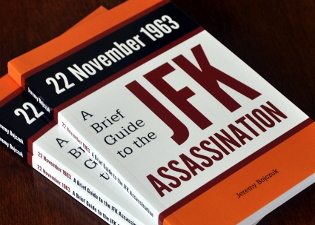 For a detailed account of Oswald’s shooting ability, and a critical account of the Warren Commission’s interpretation of it, see Howard Roffman, Presumed Guilty: How and Why the Warren Commission Framed Lee Harvey Oswald , Fairleigh Dickinson University Press, 1975, pp.225–247 (available online at http://www.ratical.org/ratville/JFK/PG/PGchp9.html). For a critical account of the CBS TV series, see https://consortiumnews.com/2016/04/22/how-cbs-news-aided-the-jfk-cover-up/ and Josiah Thompson, Six Seconds in Dallas: A Micro–Study of the Kennedy Assassination , Bernard Geis Associates, 1967, pp.292–5, from which the Walter Cronkite quotation is taken.